While there is only one true Amaryllis, many bulbous plants in cultivation share the common name, Amaryllis, despite belonging to other genera. 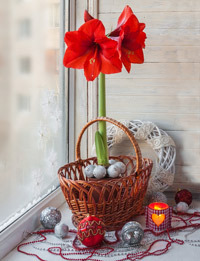 An example is the widely-grown, Christmas favourite, Hippeastrum, (left). Hippeastrum is a tender bulb that needs to be grown indoors. Amaryllis belladonna (below) grows approximately 18 inches tall with lily-like, fragrant flowers. The funnel-shaped flowers appear on naked stems in autumn. A. belladonna is regarded as hardy throughout most of the UK, however, they grow best in full sun. The soil should be well drained and enriched with leafmould or well-rotted cow manure. Plant dormant bulbs just below the soil surface, in moderately fertile, light, free-draining soil. You can add extra grit to improve drainage.